Weigela bushes make attractive foundation borders for your home, but they command just as much attention when they’re planted as a single, ornamental shrub on your landscape. Weigela bushes have purplish green to variegated green foliage and tubular-shaped flowers in shades of pink, red and white. The shrubs can grow up to 6 feet tall if left to their own devices, but you can prune them annually, immediately after the flowers have faded, to help maintain a nice shape and to promote a healthy plant. 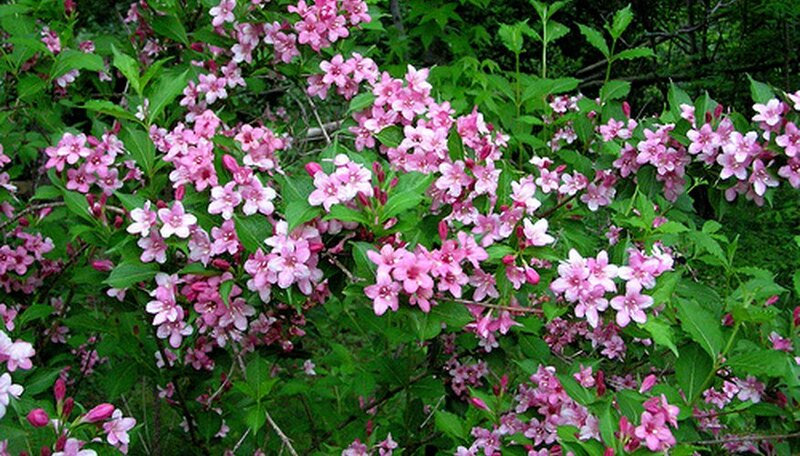 Inspect the weigela bush, and remove any dead and dying wood at ground level. Weigela flowers in the spring, so plan to prune in early to mid-summer. If you prune too late in the season, you will not have flowers next year. Weigela blooms on last year’s wood, so prune early enough for new wood to grow before the plant becomes dormant in the fall. Cut leggy branches back to a main branch or stem. Remove branches that are growing inward at the base of the stem. Remove any branches that are growing at ground level. Cut back the remaining stems on your weigela bushes to one-third their size. Make your pruning cuts just above a bud or a shoot at a 30-degree slant. Don’t just make random one-third cuts; step back and take a look at the bush, so you can create a pleasing shape as you prune. Some branches may only need cutting back one-quarter, and others may need to be cut as much as 50 percent to create or maintain a rounded shape that naturally fits any weigela bush. Discard all of the cuttings away from the weigela bush. Dead and diseased branches, stems and debris attract insects which will negatively impact your healthy weigela. Keep your gardening clippers sharp, so you can make clean cuts.